CATONSVILLE, Md. — Courtney Coppersmith is the freshman with the fireball stuff. “I can pound you hard and inside but then get you to chase at a pitch that isn’t in the zone. On the mound it’s like my zone, my home," said the UMBC pitcher. First year on the college level? No problem. The UMBC pitcher from York, Pa. is crushing the competition. Her 180 strikeouts (as of Wednesday) is tops in the nation for freshman and third overall. 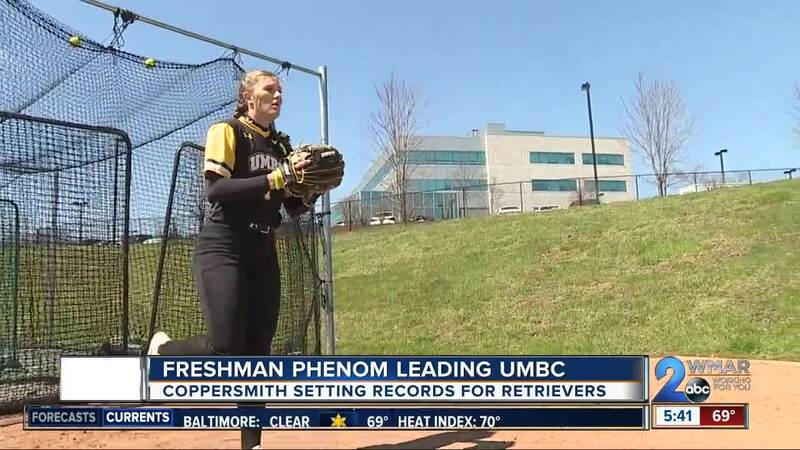 Just 27 games into the year she already has the UMBC freshman record for K’s in a season and a program record 17 strikeouts in a game. And she’s doing it all at less than 100 percent health. She dislocated her non-pitching elbow in August. “I feel like there is still room for improvement,” she said. Her greatest college accomplishment yet is the perfect game she tossed last Sunday in a win over Binghamton. “It was great,” she said. “I’ve had a lot of people come up to me and tell me 'thank you,' supporting me, being like ‘congrats’." “She was just going right at hitters, and they were just barely able to foul pitches off,” added Kuhlmeyer. That perfecto last weekend was special not only because it gave UMBC its first conference series win over Binghamton in 10 years; it also came on the same day Courtney was honoring someone she recently lost. There’s no doubt she did as she continues to pump pride into a rejuvenated Retrievers program.